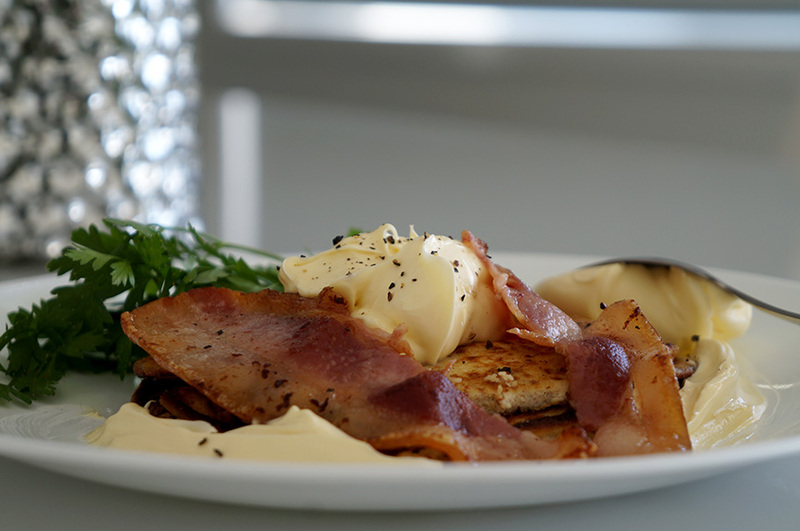 Soft, and warm ricotta pancakes paired with butter – topped with crispy bacon and a double cream dollop. Really, this dish needs no further introduction. And if your mouth isn’t watering yet – well, it should be! Now I know what some of you will be thinking at this point. This looks like a fatty and/or junk meal. Wrong. After you’ve eaten in a ketogenic style for a while, eventually you will get a feel for what foods will, or won’t affect your personal state of ketosis. Many factors play into how ‘durable’ you state of fat-adaption is, or how quickly your body can cope with an input of carbs before normalising it’s insulin levels. Whatever the case – this low-carb savoury dessert plays by the low-carb principles and ratios, and will be satisfy without having to worry about the numbers. Continue until you achieve a smooth, and light consistency. Add butter, swirl until the base is coated. In 1 tbsp of butter, pan-fry the bacon rashers. add a generous dollop of cream on the side. Repeat once and serve for two.